itsAlyx: Better Late than Never, Right? Hope you guys are having a swell week so far! Before I bore you to death with a bumpdate that I should have posted last week, I just wanted to say, "THANK YOU." Seriously - thanks for the support, for reading my jumbled thoughts, and for being awesome in general. You guys are amazing. Now before I get all teary-eyed and crazy hormonal on you, let's talk about my ever-growing belly. Or you can just click away if you don't care (I won't be offended. HA). Size of the Baby: ONION!!! Maternity Clothes: Nope, not yet. I'm going to have to cave soon, though. I do have a BeBand, and it helps SOOO much. Sleep: sleeping through the night... always take a potty break at about 5 a.m.
Best Moment of the Week: Music Time with the baby... We started it about halfway through week 17, and by Sunday, baby started to respond and kick a little when we'd put the speakers to my belly! Movement: S/he moves quite a bit around 3-4 in the afternoon. Symptoms: None! Okay, dizziness. But that's not bad, right?! Food Cravings: SUGAR. SWEETS. Someone tell this baby to CHILL. Gender: Find out Dec. 21st. My guess is that it's a girl. Anything making you queasy or sick: I have to drive wherever we go - I can't be passenger, or I get REALLY sick. What I miss: Being able to workout harder. What I am looking forward to: Finding out the gender!! Nursery: It's pretty much completely done. Oh, except furniture. That might be important. I do have a crib, glider, and changing table/dresser picked out, though! Emotions: MUCH better. Still not normal, but they have finally started to get under control. Stupid things I have done: Running over our mailbox. Yes, that is baby's fault. Stay tuned for a list of things that no one tells you about pregnancy (from a total non-expert) sometime this week. I promise to scar you for life. I love your bump updates :) I'm excited for you to find out the gender! It made it a lot more real for me once we knew she's a girl. Glad your hormones are settling down for ya. My colleague at work is 8 months and very tearful at the mo. It might be the approaching maternity leave! Just cave and buy maternity pants...you'll be so comfy. 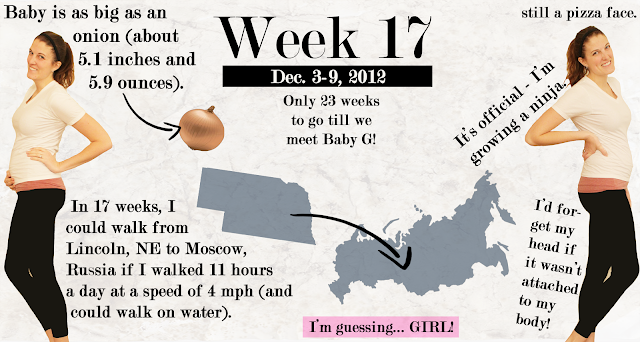 My weekly update told me the baby weighed as much as a large Jimica. What the heck is that even!? How is that supposed to be a reference point? Anyhow, enjoy your ninja, and don't buy maternity pants online. Mine have never fit right, I can't WAIT to get back to regular jeans! This is great! I look forward to you imprinting bad memories of pregnancy on my mind later this week! Are you sitting down? Your emotions will never be in control again, you are growing a ninja and becoming a mom! you look beautiful! Oh pregnancy... I don't miss it. I have a few friends who just *loved* being pregnant... but not me. I like alcohol and sleeping on my tummy way too much! :) The baby part is so worth it though. Are you going to find out the gender or wait until you give birth? Eep you're so close to finding out the gender, I'm psyched for you! I love these posts and I'm sure you will love looking back at them later on! I think it's a girl too! Look at your cute little baby bump!! I love it. Not your baby, because that might be weird considering you barely know me. I love you being preggers because it's cute. Okay, now I'm just rambling. I think it's going to be a boy, but that's just me! Can't wait to find out and see what you name the baby! Your belly is SO adorable!!! I hope you show pics of your nursery. HOLY BALLS... THE BALL IS GOING TO DROP!